Once again I got my passport stamped at the border and followed a trail of breadcrumbs to the secret Montane bunker in the Lakes. What was in there in glorious 3D Technicolour was the winter 2010/11 winter kit, including a bunch of all-new stuff. The eVent Evolution above that usurped the Super-Fly has been tweaked and stays in the range, and as you can see it sports the revised Montane logo and branding. It’s now embroidered and looks much better than the current printed version that does look a bit like a free temporary tattoo. eVent is strong in the range, so scaremongering regarding its imminent demise should be read with a raised eyebrow for the time being. Below we have the much revised and much improved Super-Fly XT. The old version had a great hood, nice big pockets, but I though it was a bit heavy and baggy unless you were layered up in abundance underneath it. This version is much cleaner, it feels smooth, uncluttered and lighter too, at 580g for the sample. It feels a little more “alpine”, and I don’t know if this is the influence of the new ex-Mountain Equipment designer, or just the result of tidying up the jacket, but it’s a good move I think. Above we have the azure and steel versions of the new ladies eVent Venture shell, and below my mate Stuart Smith from Adventure in Mind who came along for the ride, sporting the new mens version in black. I know the Venture has a lot of fans, but I have to say that while the fabric can’t be faulted, it does look helluva clunky. The new version is cleaner, lighter, has the same Hurricane 3-Layer eVent with the microtaped seams that Montane are using throughout the range, same two big chest pockets and now with a face you can take home to your mother. Unlike myself who is wearing the Moroccan Blue with orange zips version a bit further down. 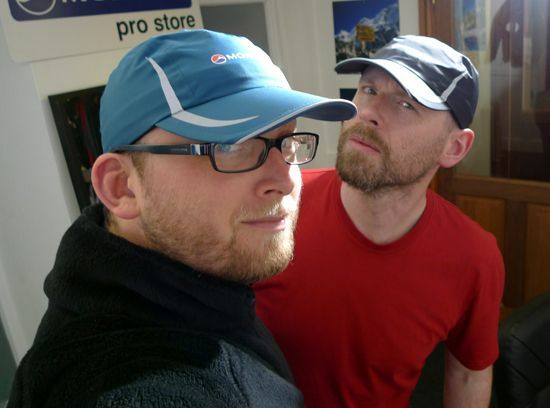 Paul (who regular listeners will know as Montane’s man-in-a-hat) and Stuart are wondering how some pastry icing got onto the MRT version of the Super-Fly XT, and it wasn’t me I can tell you. It’s in Alpine Red with extra reflective detailing. I like reflecto on my gear, at camp and at night hikes it soon becomes vital (never mind how much it’s needed on MRT kit), and a recent conversation with a day-only person who saw no need for it at all reminded me about how many features are either lost in translation or misunderstood. “I don’t use/like that, so it’s rubbish” No, no, no. 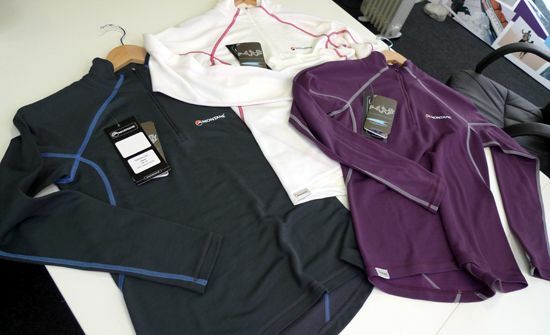 Below is the eVent Angel jacket, the ladies cut of the Evolution and in a fine set of colours too. There’s a steel as well, but well, you know me. It’s nice and long, and I like the hood. 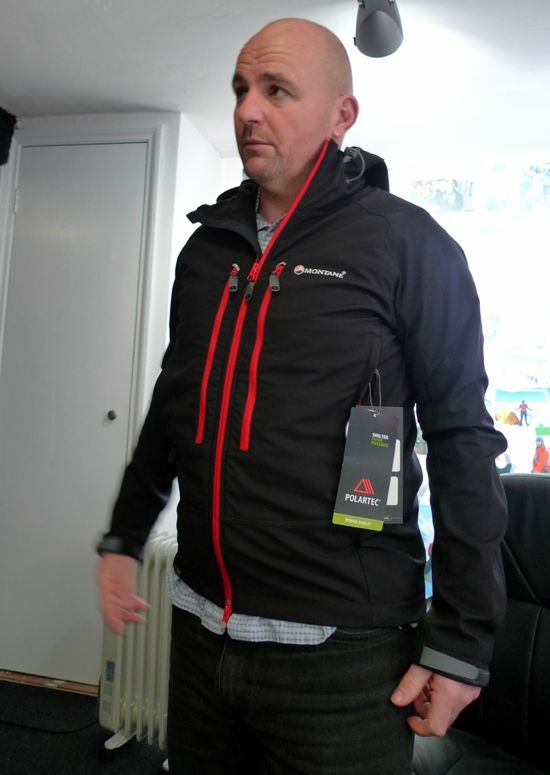 Montane’s hoods really are much improved these days. Try wearing one of the current, or even recent shells in a storm, then go back to a first generation Super-Fly in the same weather. You’ll cry. Anyway, 375g for a jacket well able to fend off winter with three chest pockets is bloody good. We all know of the imminent and inexplicable demise of Haglöfs LIM Barrier pullover, but we also know that everyone and their donkey has produced their own model to try and fill the void. 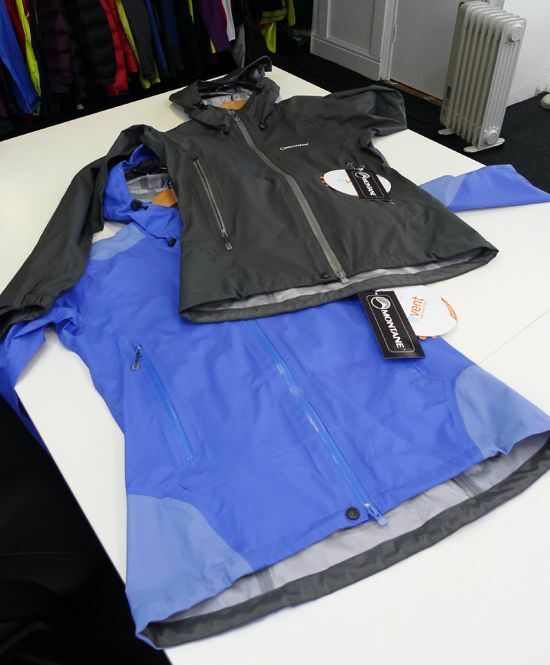 Most of them are very close on features and materials, Pertex or Pertex-a-like and Primaloft, so it may come down to fit and price. Montane go a little further though, still Pertex (Quantum Ripstop and Quantum Core), but the Primaloft is 40g ECO recycled and there’s no pocket at all. So the 240g Fireball Smock really is about as minimal as you’re going to get, a little lighter and a little smaller packing that the others, but just as warm. It’ll be interesting to see the forum debates about “Do I need a pocket?” when all the new models hit the street later this year. I like it, it’s proper fast and light, stowable insulation with no penalties to endure when it’s in your pack. Double ended zip too for venting and getting at pockets without losing heat. 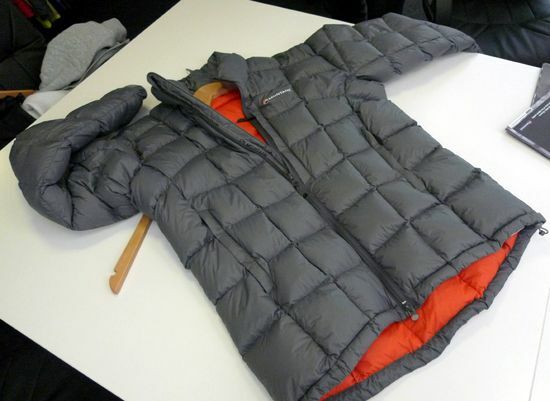 Above is the new Anti-Freeze down jacket. The sample is 410g and is filled with 170g of 93/7 Ukranian goose down, 800+ fill (US). 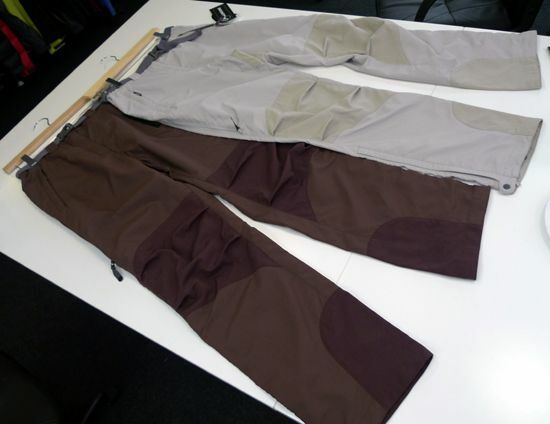 The fabric is Freeflow Ultralite which has a decent water repellency. There’s a Napoleon pocket on the left chest, drop tail, adjustable cuffs, neck and hem. 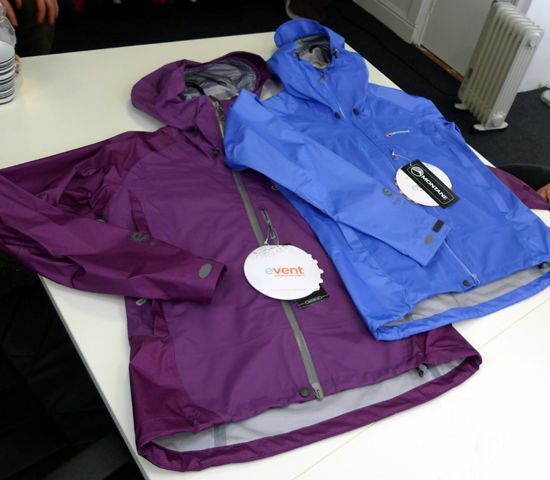 Below is the all-new North Star XT, the “Mountain Enforcer” version of the current and very successful North Star, which also stays in the range (ladies version in purple below). The down and fabric details are the same as the Anti-Freeze above, but the XT adds Entrant V waterproof reinforcements to the shoulders, hips and forearms. Also as the Anti-Freeze it comes with a waterproof stuffsack, but adds water resistant zips. It’s a bit beefier than the North Star at 685g, but the extra protection and less worry that it brings will probably prove popular. The good news is that it comes with that cracking black outer/red inner combo as well. 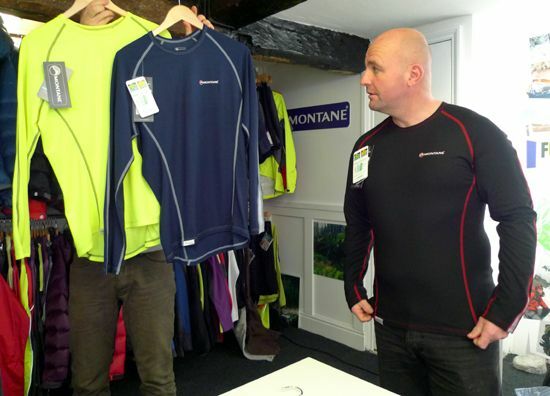 Above and below are the Bionic long sleeves baselayers. These come with a 62% polyester/ 38% merino mix fabric. 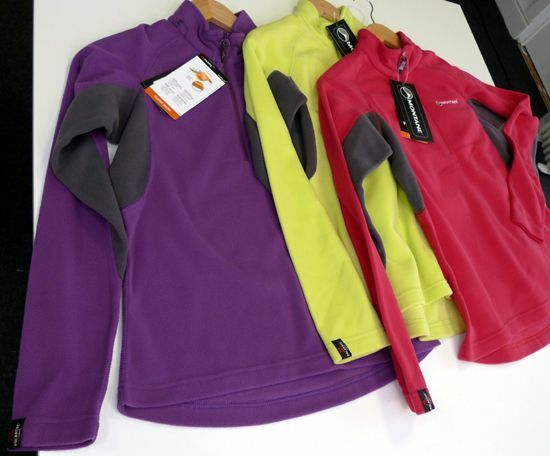 I’ve used this fabric plenty and it works very well, and the long sleeve is an existing model in nice new colours, but the zip neck below is all-new. The zip’s a good length for venting, the cuffs have reflective flashes for evening runners, and it’s a nice looking bit of kit. The ladies colourways are just doon below a wee bit. The Dragonfly below continues as a good heavy base or light mid layer, or is that still “Expedition Baselayer” in common parlance? 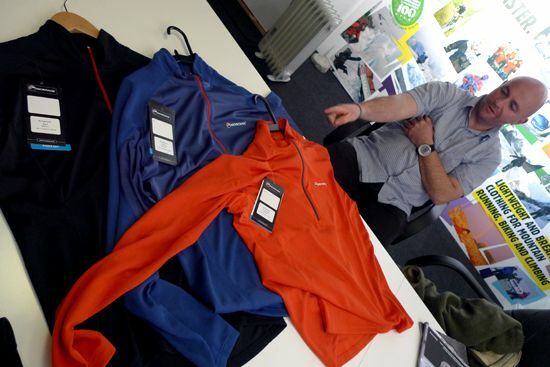 Whatever, an orange jumper is always worth a mention, and the other new colourways are neat. Below is the ladies version, the Mayfly. As always we see the best colours of their side of the fence. 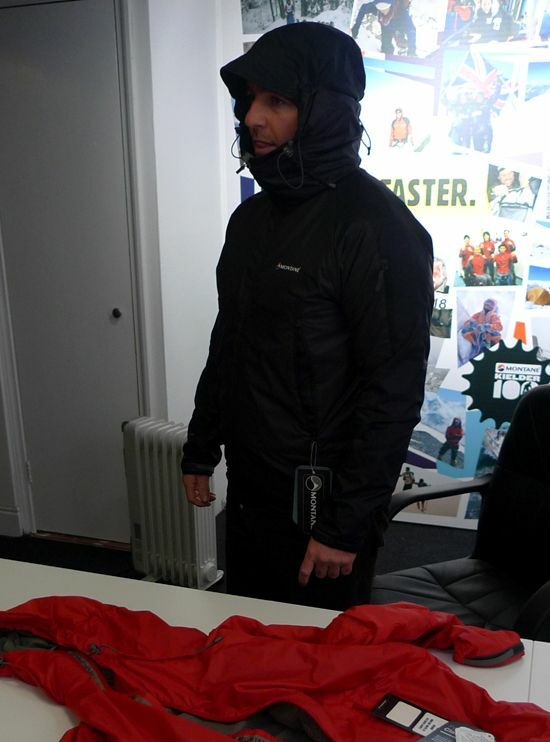 Above Stuart is confused by the heat generated inside the new Resolute Smock. The proper fixed hood. cordura reinforcements, weatherproof EPIC fabric and water resistant zips make this a step-up from the other Extreme kit. 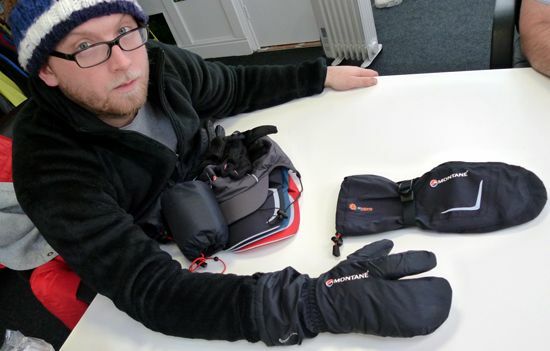 It’s Arctic expedition kit this, and whether or not you have a use for it you kinda feel like you want one. Just in case it goes all “The Day After Tomorrow”. Below is the wummins version of the Extreme jacket. There are colour options across the range, the obvious black and olive sits with red, moroccan blue and the berry below. Demand such choice from your local emporium. You can also have Extreme legs. The new Pants are above, big long double-ended leg zips for venting and easy on-off in the tent, multiple pockets and mighty reinforcement. The Salopettes are below, the add full length side zips and handy chest pockets. 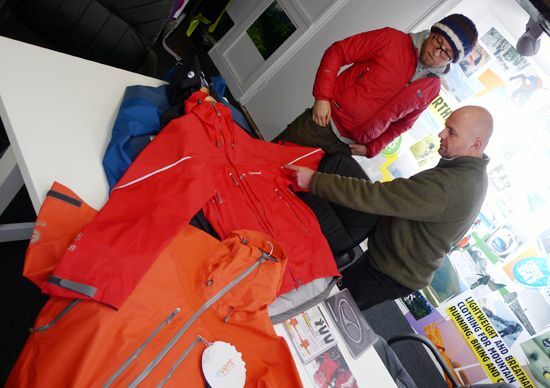 I can see why pro’s wear this stuff, if you’re hanging about watching a bunch of folk practising ice axe arrest or abseiling day after day, the toughness and warmth at rest is right on the money. 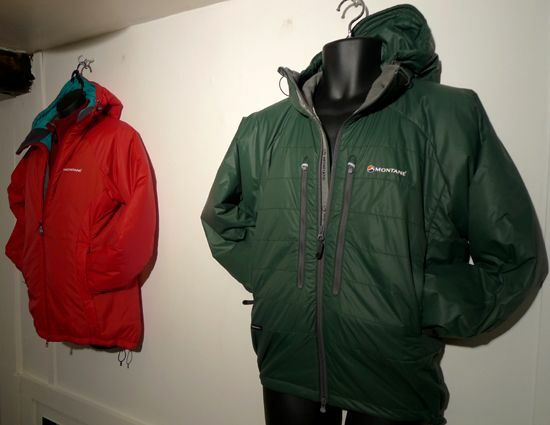 Also part of the Exreme range, there’s a welcome return of the Krypton name to the Montane line-up. 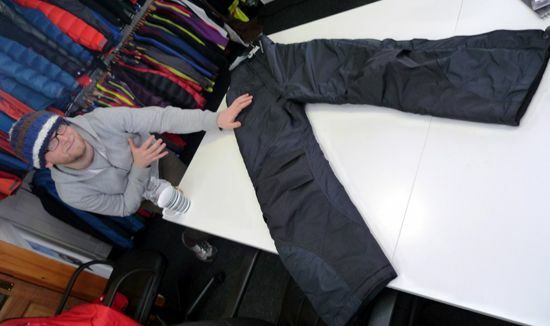 This is a 375g Pertex outer/Dryactive inner mountain softshell. Think Vapour Rise. Proper hood, chest pockets, wee sleeve pocket, adjustable cuffs and all-day wearability and comfort. There’s black and the red you can see on the table. This is going to be another “Is the Krypton better than…” on the forums when it comes out. The Flux gets a new colour for the men, that dark green colour above, but the new woman’s Flux gets some cracking colours, the Red above and the two seen below. But girls don’t get the napoleon pockets. I’m assuming they’re seeing a conflict between biology and storage options here. It does bring the weight down to 450g though, 70g lighter than the mens. The outer is an interesting mix of Pertex Microlight Mini Rip-Stop and Toray KUDOS XR, and I don’t know if I’ve seen the two manufacturers mixed on the same bit of kit before? The fill is Primaloft ECO 60g and 40g which I’ve found warm enough at rest, but also wearable on the move through winter on the colder days. And nights! I’ve had a current season one on test for a while, it’s been well used and I’ll have an update soon. Great kit. Above is the Chukchi Shirt for the girls. It’s a dead simple Polartec mircofleece pull-on. Great colours, 175g and altogether much nicer than the blokes version. 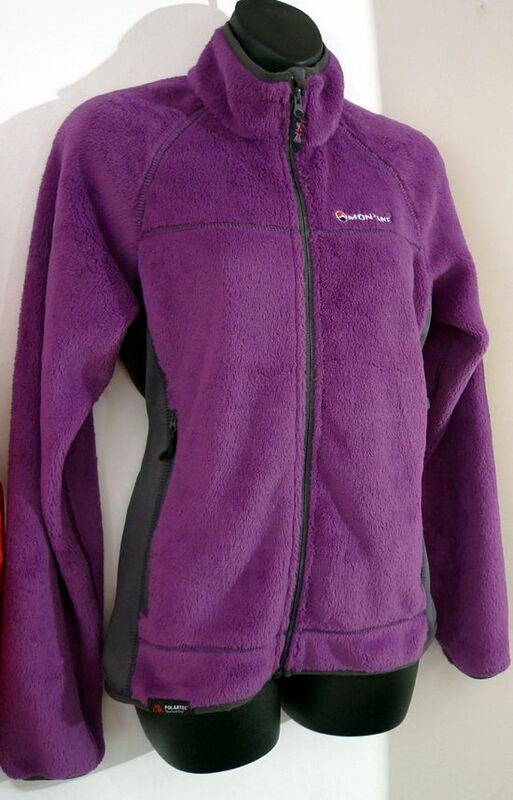 Below is the lovely berry coloured wummins Vixen Jacket. 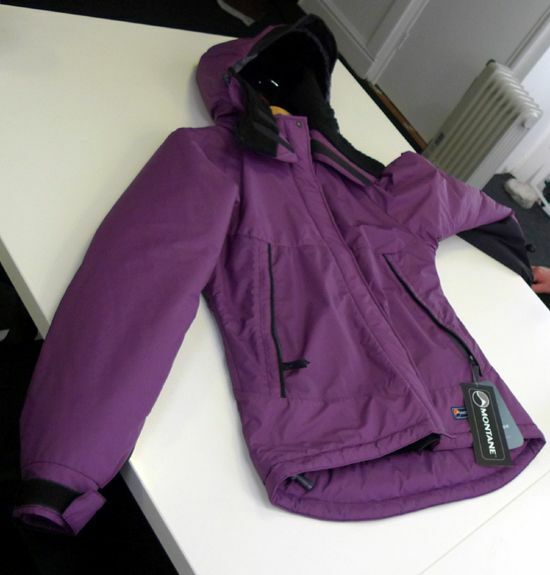 It’s in Polartec Thermal Pro High Void (the purple furry bit) and Dryacriv Stretch. It’s got a nicely fitted cut and it looks great. Aye, it’s still technical, but it’s nice to see something that makes you grin because its fun as well. What the hell is that on my head? That’s the new Featherlite Mountain Cap, a Pertex Microlight Shell with a 40g Primaloft ECO fill, all quilted to keep the insulation neat and in place. 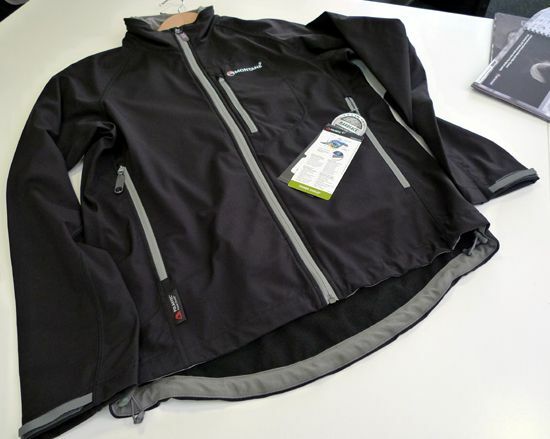 It’s got a proper peak, drawcord at the rear, neck loop, reflective detailing and weighs 45g. Yeah, I want one too. Those boys below are the Extreme Glove. Pertex 6, Dyactiv 2000 pile inner and Primaloft on the back of your hand. Dexterity and fit is very good indeed, and the features include all the details you look for, nose-wipe, security/hang loops, adjustment,grip. Not waterproof, at the temperatutres you’ll be wearing the they don’t need to be, and they’ll be much more breathable for it. 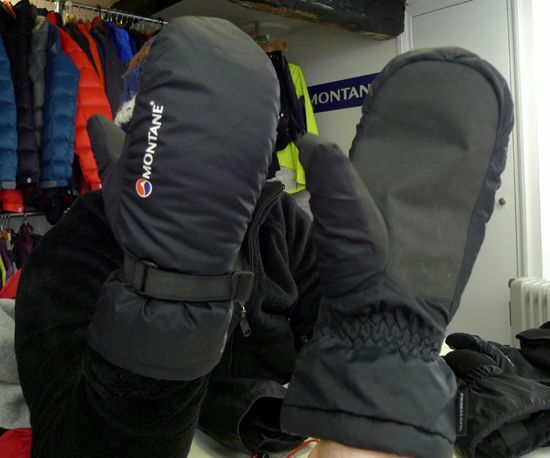 The Extreme Mitt above follows the Extreme Glove in terms of materials and design, but as a mitt it’s be toasty and great for well, extreme conditions. 130g a pair too. Below is the Resolute Mitt. It’s a combo set-up with an eVent waterproof outer, Hypalon grip surfaces, nose wipe, cuff and wrist adjustment. The inner is a Pertex 6/Dryactiv 2000 pile “lobster” mitt with an elasticated wrist. Modular systems for your hands are ideal so you’re not faffing around changing gloves, and this slightly different take looks like a good one. 250g for the whole set up. 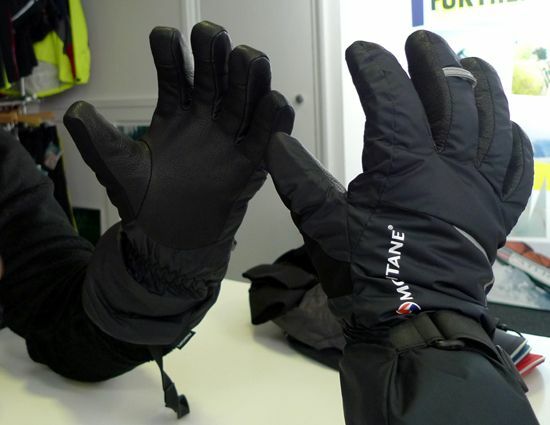 Stuart and I both tried to steal these, Powerdry Gloves. Simple Polartec liners with well shaped fingers and great articulation. The grips on the fingertips are little Montane logos and there’s reflecto on the back too. The Pace Cap above is an eVent baseball cap with reflective trim, elastic drawcord adjustment, inner fleece headband and a weight of 45g. 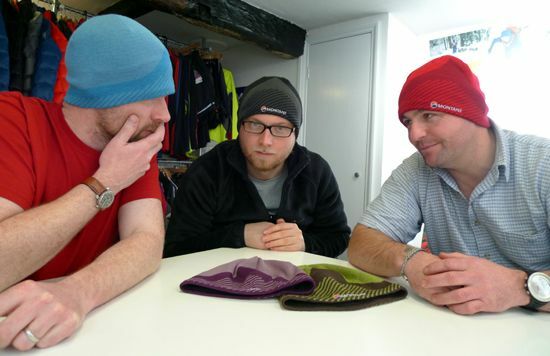 The Knitted Beanie’s below are a 50/50 wool/acrylic blend and have a neat six-seam crown for smoothness in looks and under a hood too. Nice, it’ll make a change from seeing the usual suspects logos on folks nappers on the hill. Or at the Tiso cafe. That’s the new Mantra Jacket above. It’s in Polartec Powershield with three pockets, velcro cuffs, reversed zips for smoothness and adjustable hem and collar. I like the mantra’s subtle grey zips, it contrasts well with the new sexed-up Sabretooth below. The new Sabretooth’s Powershield fabric feels tougher with slightly less stretch, not a problem as the articulation is already good. the hood’s had a tweak with a wired peak and volume adjustment now present and correct. It feels more like an outer layer now, rather than a midlayer that punches above its weight. It also looks a bit like Gary Numan’s Telekon outfit, so it’s a win/win. That’s the girls Mantra jacket above which i think looks brilliant. The contrasting stitching brings out the shape of the jacket and it’s just dead classy I think. Again Polartec Powershield, and all the same adjustments. The weight is 430g which is fine for a softshell. Last word goes to a classic, a legend you might say. 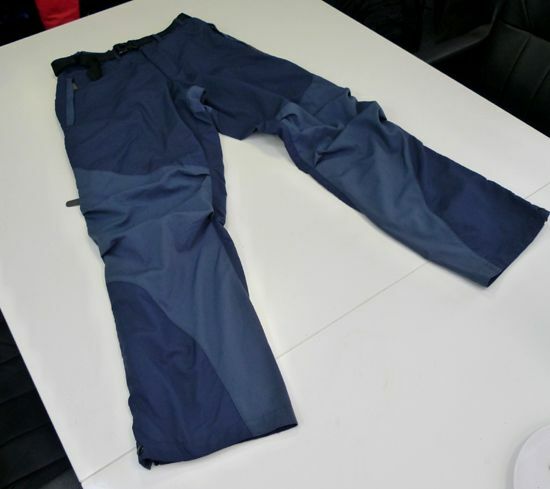 The Terra Pant. There’s been a lot of subtle changes to these over the years, detailing more than anything, but the belt not being trapped in that full length waist-channel was the best upgrade ever. The guys get the two-tone midnight blue above, and the girls get chocolate and gray below. My initial reaction to the girls colours were that they were Star Wars uniforms, possible Hoth and Endor. I was assured this was not the case. I still have my doubts though. I can see a change running through the range. there is a new direction in there, albeit subtle. There’s also a confidence evident, from the range of accessories, to the use of alternative fabrics to the norm, to the colours and the “our way” attitude. Even things like the fit of the clothing, slimmer, less compromise. 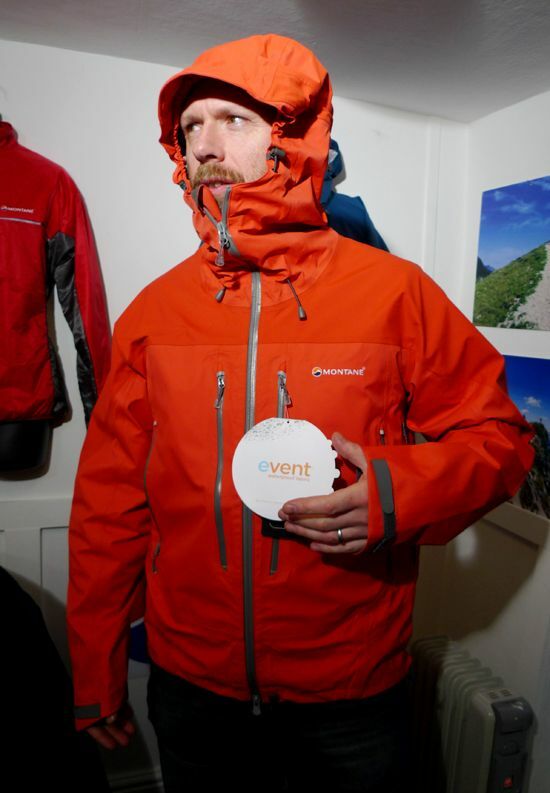 It’ll be interesting to see where Montane are heading over the next couple of years. Peter, what is happening out there in the synthetic Vest market? Will the Barrier vest be available in other colours? 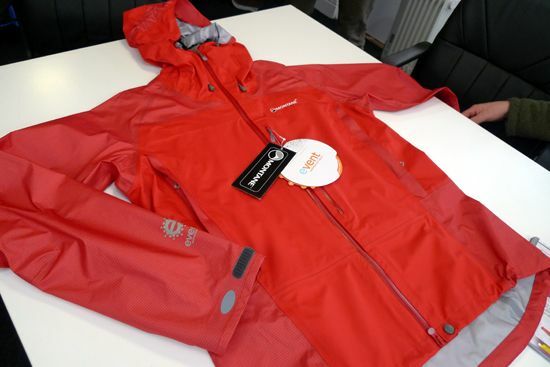 Are Montane and OMM offering anything similar? I’m after one for stuffing in a bum bag as backup when out running for several hours in the cold and rain. The Barrier stays black-only, nothing from OMM, Montane is a possible, but not for a while (There’s an MRT version I think?). 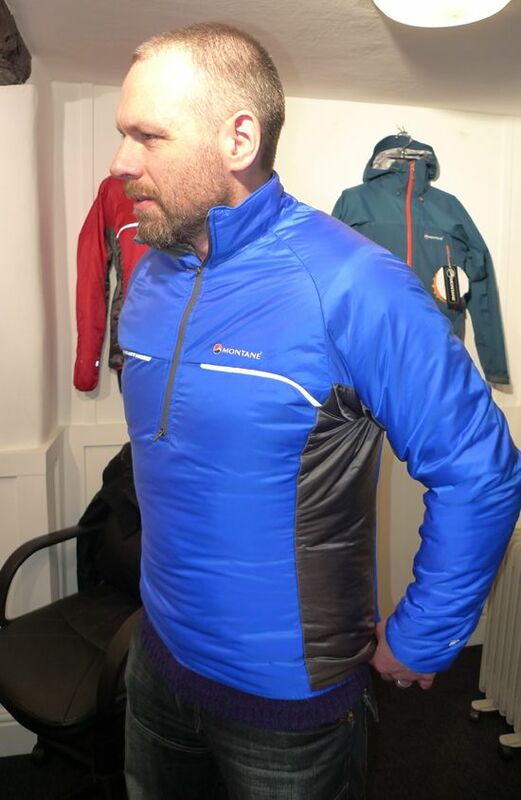 I like that Berghaus Chulu vest I’ve got on test, and I’ve got a great Karrimor version in Pertex/Primaloft that never made it to production. Rab do one, Patagonia too. 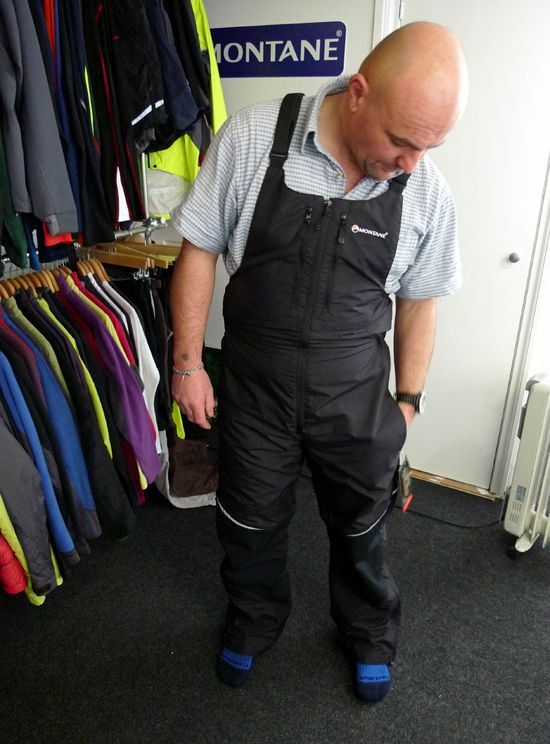 There should be more choice, it’s a handy bit of kit, and better than down in the wet. Been putting off reading this. Knew that post trip euphoria would have me reaching for my wallet in the belief that I need, and would use, everything on the list. Now spring is in the air here thought that I’d get away with it. I was wrong. I really want that resolute smock. And those mitts!! Felt up an extreme smock once. It’s like Buffalo should be. All the stitches in the right place and arms and holes were the corresponding body parts are on humans. Only thing is I think I’d sweat to death. I was running hot in vapour rise and merino at -10°C. Maybe I’m gauging fibre pile wrong though? Got a mate who’s used a mountain shirt (and I mean the same one) year round for half his lifetime (take your age and divide by two and you won’t be far wrong)and he swears by the stuff. Looking forwards to what you’ve got to say on the subject. It is a magic bit of kit, but it is warm. I’ve worn it quite a few times now (which reminds me, I’m going to start writing up my Kilpatricks trips again, because all the gear stuff is in there), but never on an overnighter. That’s where my mind will get made up I think. 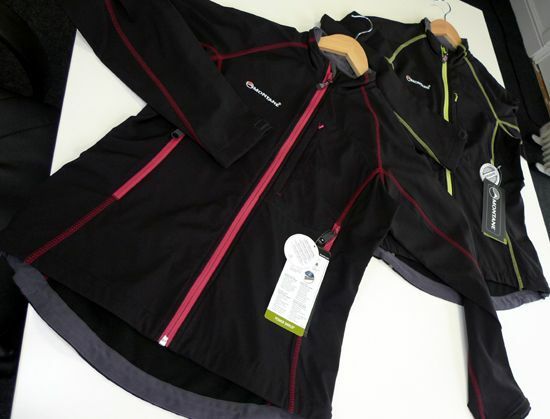 The second question, you are wearing atomic stretdh jacket in one, picture, whats are yours height and weight? 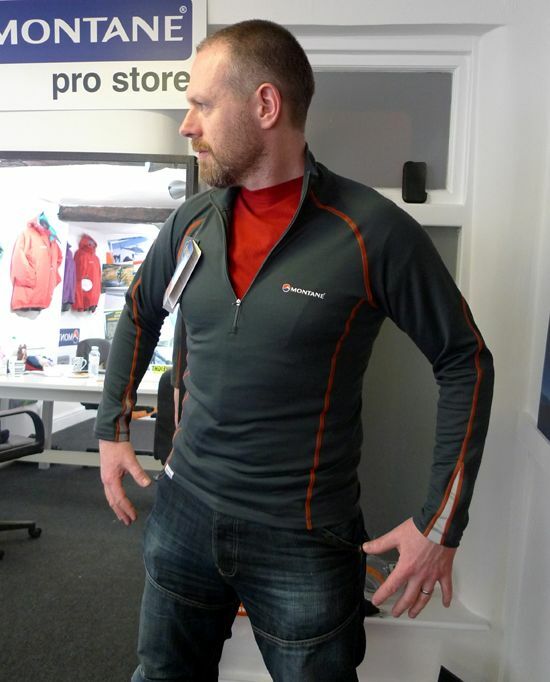 I’ve just got a Millet top and I’m my usual size large (Montane included). But I did notice that some Millet kit is sized a little smaller than other brands. 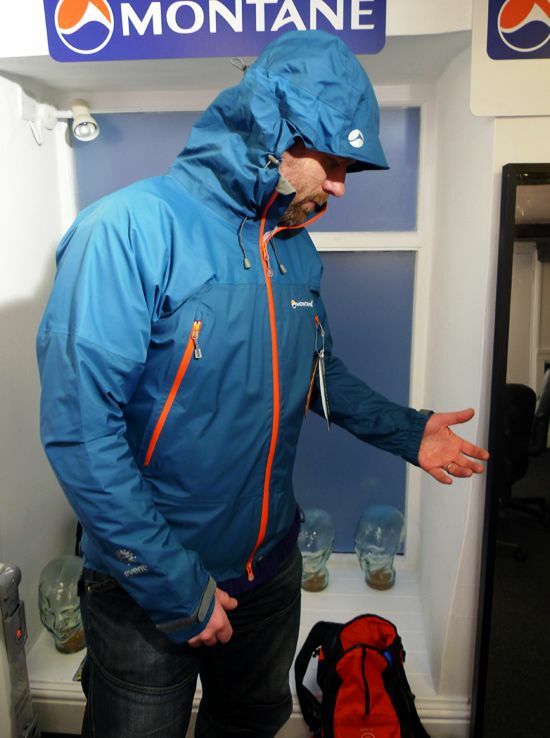 The Montane samples above are mediums so are a little small for me most times, I’m a little 5’11” tall, 42″ chest and 36″ waist. Hi pete how do you rate the north star to say a rab neutrino warmth wise. 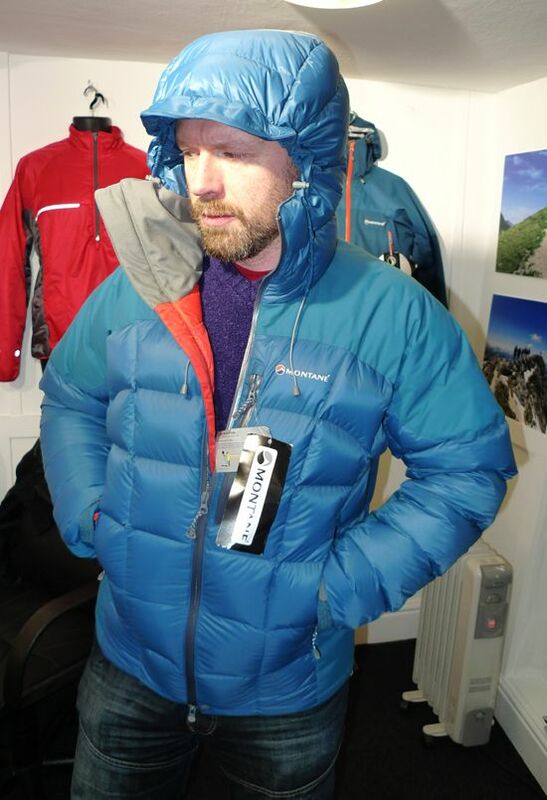 I like the look of the montane and the fact it has a roll away hood it ticks a lot of boxes but not sure it would be warm enough. On paper the Rab should be a little warmer, better down fill. The XT version of the North Star has more down, but it’s a wee bit heavier with the tougher outer fabric. But it’s going to be a fit issue as well, to be honest I’d be happy with any of the ones I’ve just mentioned. No losers there really. 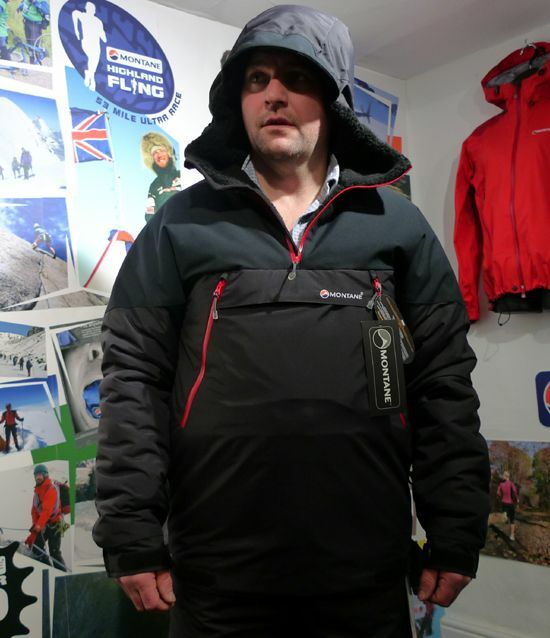 Another bit of your brain required have you got/tried the Haglofs LIM down hood jacket. Done a search but nowt came up. I’m sure ive seen it somewhere on here, anyhow if so how do you rate it. Got the chance to possibly get one of the grey with yellow lined ones like my vest which is tremendous. Thanks again and soz for keep digging old threads out pal. Got one right here! I remember when I wrote something about it I said that putting it on was like walking off the mountain into a warm room. It’s warm, light for what it is and will bring you much joy in winter! My head looks all wrong in that photie. 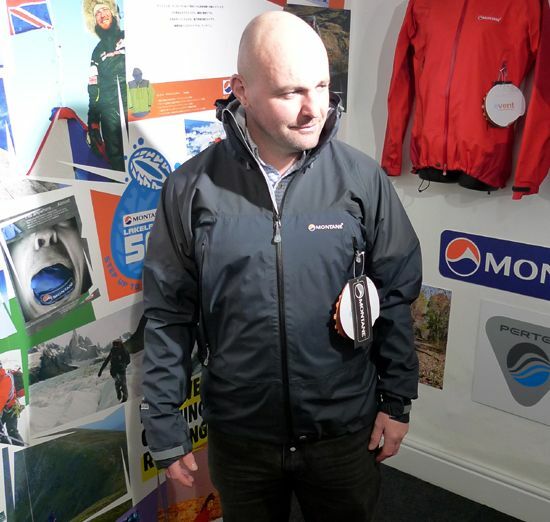 Thats the very one Phil oh by the way do any of you know the Hydrostatic Head of Haglofs performac fabric. May sound a daft question but was wondering what it was compared to say ME drilite loft as that is 1500. I’ll have a shufty as some of the tech info I’ve got and see if I can find out. Aye, sometimes you get a “spray rating” for non-waterproof fabrics. I might still cast an eye oper the workbook when I get home! How bizarre! 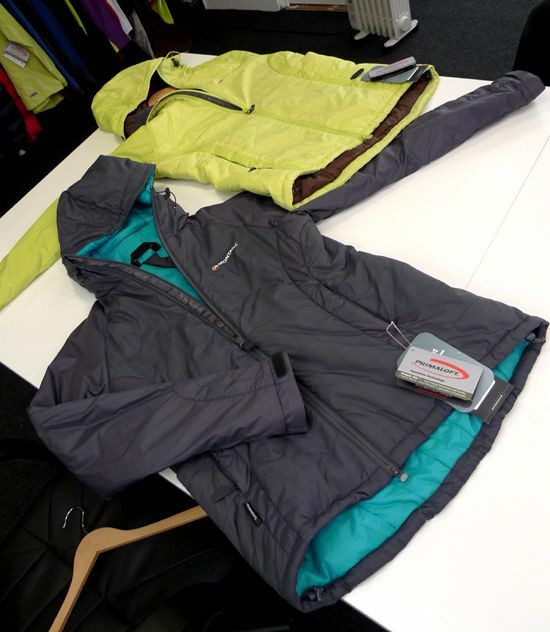 I saw a red Montane Krypton jacket yesterday in GoOutdoors mis-priced at £36 and thought, ‘i don’t know what it is, but i like it’ totally forgetting i had seen it here and even commented that i would choose between it an a vapour-rise (too late, i have VR-Lite and Trail, stretch top). Well today, despite my forthcoming pecuniary difficulties i bought one (it’s being given to me for Xmas so i’m allowed, i guess) and it’s brilliant! 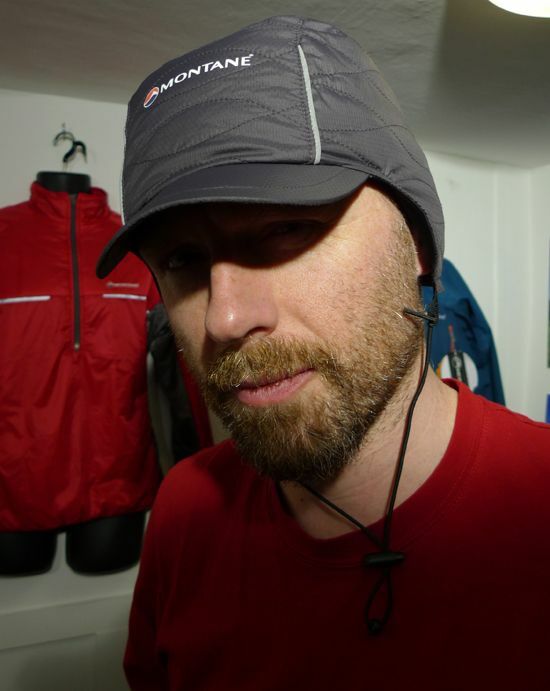 not only is it odd that i forgot i had received the heads-up from you and noticed it specifically among the new products but also all the comments about a former ME designer working for Montane. What the Krypton reminds me of is not a Rab VR jacket but an old proto-soft shell type ME jacket i bought and wore to destruction ages ago and only chucked out this year. it had the same sort of lining, a pertex or pertex-alike outer, collar-stowed hood and a metal whistle built into the zip (which I eventually lost). The Krypton is more fitted, has an excellent hood and the arm pocket (the ME had an inside one, or maybe two). Not exactly sure where the Krypton fits in my wardrobe of jackets but it is an instant favourite crying out to be used. Luckily, my local GO were foolish enough to price it with printed tags saying £36 down from £40 instead of £76 down from £80. They have a habit of this (Rab Generator vest £13.50) and i have a habit of noticing (see Rab vest). 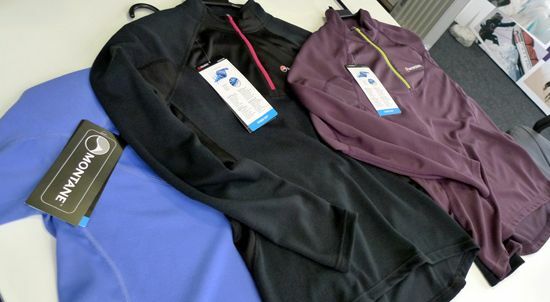 They also have old style Montane Venture jackets for £69 (or thereabouts) in store, blue or red; which strikes me as good for the eVent and general feel. 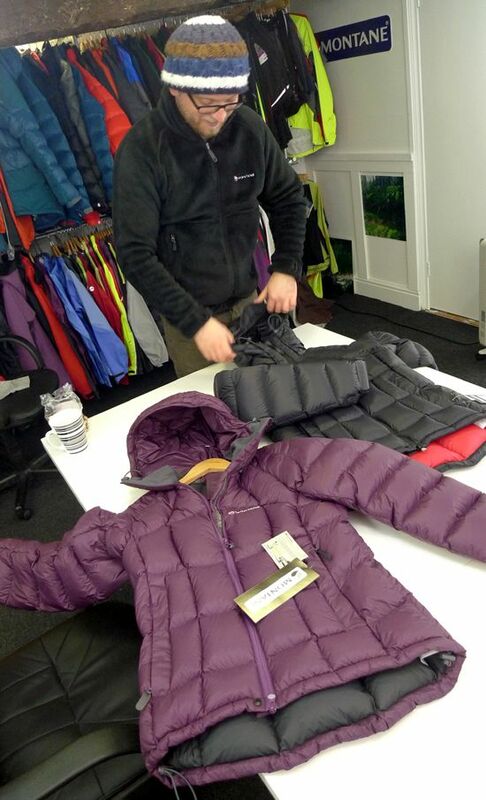 That said, I’m holding off as i love the new Montane (and Rab to be fair) hoods and the old Venture’s one has the distinction of being better than a Marmot Pica hood and nothing much else. Still a bargain though as the rest of the jacket is lovely and less sack-like than the much dearer Rabs. Hold on! I’m almost convincing myself! Beware sizes, I’m normally a medium but a large fitted fine. Hi Pete, Happy New Year to you and yours! I did want to ask you about gloves though. I layer meraklon liners under Rab Phantom Grips when it is cold enough but this sometimes isn’t enough. 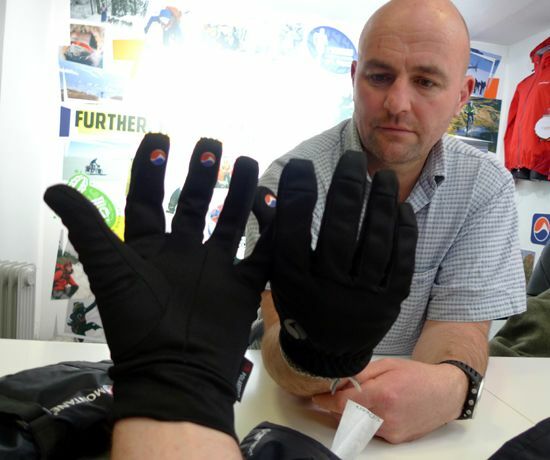 I liked the fit of Rab’s VR Tour gloves but wondered which you thought best out of Rab’s Baltoro gloves or Montane’s Extremes? Good call on the jacket, still along standing favourite here. The Rab gloves I like are the Powerstretch ones with the grip pattern, oddly the Phantom gloves less stretchy fabric makes my fingers cold?! My current combo seems to be mostly my dot-palm stretch liners with Buffalo DP mitts on top when it’s cold or Haglofs Gram mitts when it’s wet. I still like Powersterch gloves though, wee bit of wind resistance and warm when wet too. A lot of the time glove choice will come down to fit and for me Rab, Marmot and Haglofs are perfect on my hands.